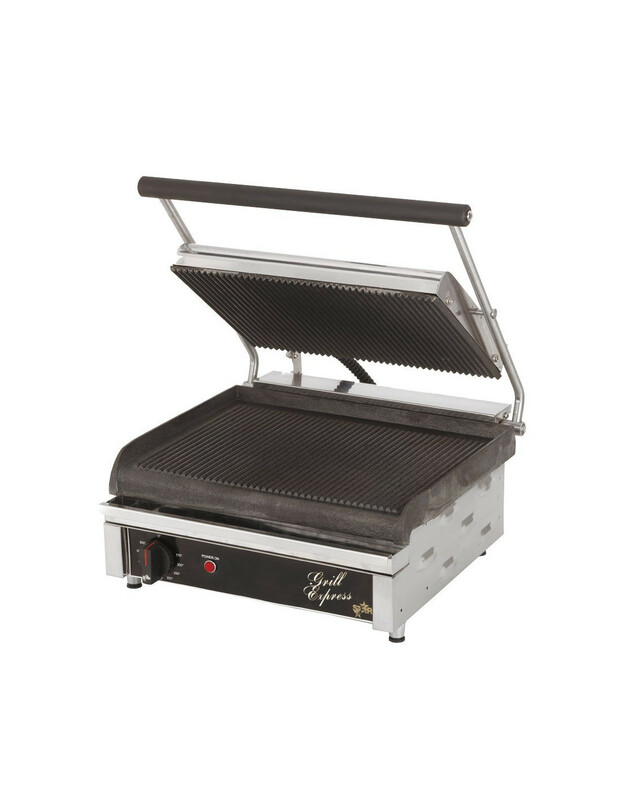 The GX14IG Panini Grill has heavy-duty and grooved cast iron plates which are very durable and easy to maintain. The heating elements of the unit are embedded in the cast iron plates. This feature provides even heat distribution, which is the secret of the excellent results which can be derived from using it. 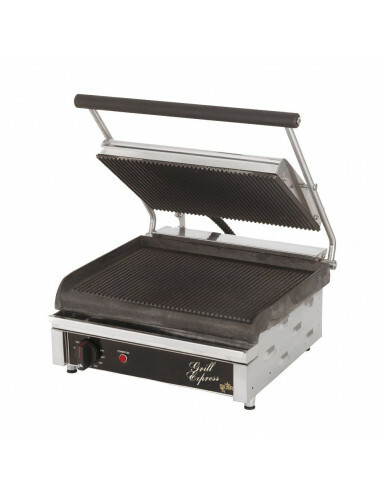 The GX14IG Panini Grill has a hinge system and a self-adjusting top plate, which ensures that grill can handle food products which are up to three inches thick. The 20-gauge stainless steel construction of the unit makes it rugged enough to handle the heavy use in a commercial setting and easy to clean, which is always crucial in a busy workplace. You don’t need to waste a great deal of time in cleaning it up. Compact enough to fit even in the most space limited kitchen. With all of these features, it is easy to understand why the GX14IG Panini Grill is going to be an asset for your establishment. Don’t forget the fact that it is made by Star Manufacturing, which has a long history as a recognized maker of high-quality restaurant equipment. Star Manufacturing was founded in 1921 in St. Louis, Missouri. Soon after it was established, the company became a leading supplier of equipment for restaurants. It was associated with commercial equipment like hot dog machines, popcorn makers, & toasters. The 1980s saw the company moving to a new facility in Smithville, Tennessee, which it expanded in 1990. Today, Star Manufacturing is part of the Middleby Corporation, which is the world’s largest group of food equipment makers. Star has been the leading manufacturer of restaurant equipment since 1921 in St. Louise, Missouri. They have an extensive range of products like the Star SWBS Waffle Maker, Star Max 548TGF Countertop Electric Toaster Griddle, and world-class Star Grooved Top & Bottom Panini Grill. Star is among the largest manufacturer of heavy-duty and high-quality kitchen equipment in the world. This is the best partner in helping you in your growing business.